» Cold Brew Coffee – Is it Worth The Hype? 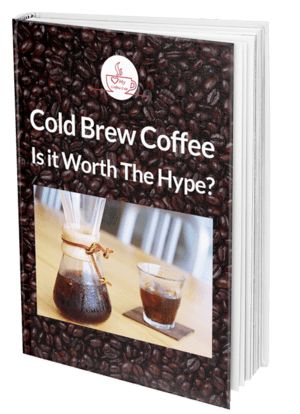 Cold Brew Coffee – Is it Worth The Hype? Interestingly coffee lovers are always caught up in a tug of war about the various forms of coffee. What’s even more exciting is that the debate has been going around for years and the momentum hasn’t slowed down yet. 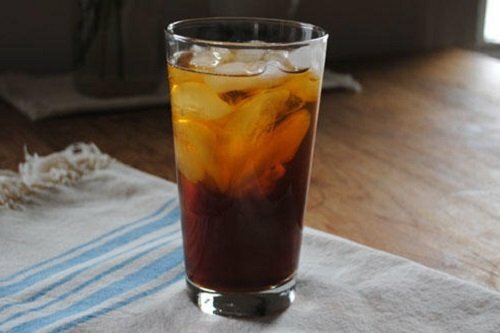 Cold brew coffee also has its magical moments and it is one of the more popular categories of iced coffee making. 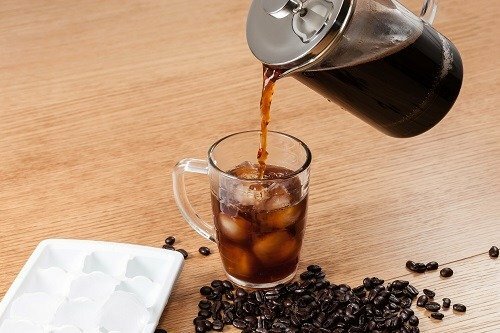 Traditionally iced coffee is made when freshly brewed hot coffee lands on the ice and is cooled instantly. But cold brew coffee is made a little bit differently. 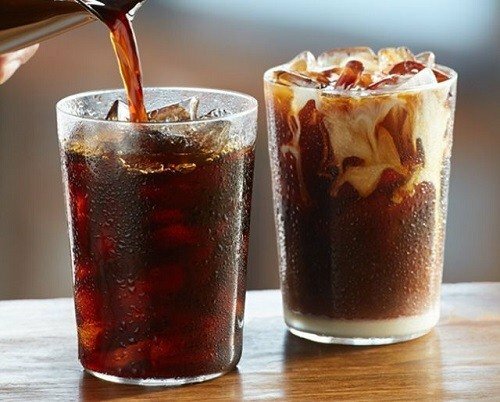 Iced Coffee And Cold Brew Coffee – What’s The Difference? Will Acidity of Cold Brew Coffee Hurt My Stomach? One of the primary reasons customers love cold brew coffee is that they no longer have to use the rancid leftovers from the last batch of bulk coffee production. The good thing about making cold brew coffee is that it requires very little human involvement at the start and finish. This means popular busy cafes can schedule a steady stream of cold brewing without demanding a great deal of attention from the staff. Cold brew coffee is iced coffee’s cool sibling but they are different. Well, the all the difference mainly comes down to the brew process itself. To give you a better idea, let’s break down how the different types of coffees are actually made. 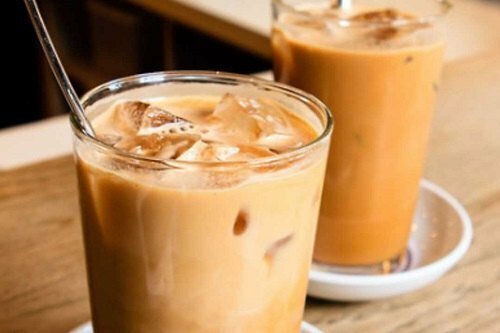 Sometimes people use the terms iced coffee and cold brew coffee interchangeably, but as stated earlier, they’re not the same. If you read or hear the words “iced coffee,” you should automatically assume that what you will receive will not be cold brew coffee. 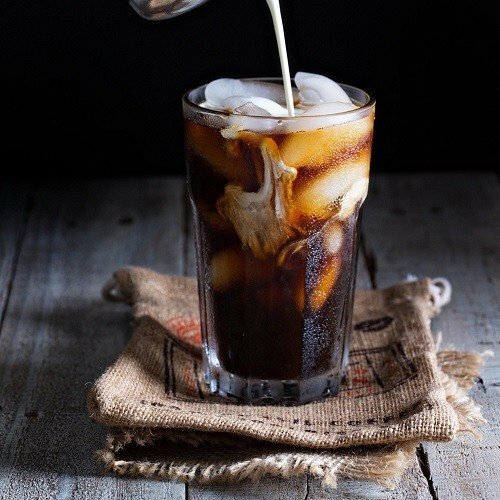 How do you go about making iced coffee? You brew your coffee as usual with hot water and then put the fresh brew in the refrigerator and let it chill for a few hours. If you wish, you can add ice, milk and sugar or even drink it straight up. To make cold brew coffee, you need to pay attention to the temperature of the water you are brewing your coffee with. As you can guess, you need to make cold brew coffee with cold water instead of warm or hot water. There are two common methods for making cold brew coffee – immersion and slow drip that shall be discussed in detail later. Generally, for cold brew, you need to combine ground coffee with cold water. The ratio for cold brew coffee ideally is about 4:1 (water: coffee) which means for every one tablespoon of ground coffee, you need to at least ¼ a cup or 4 tablespoons of water. Coarse ground coffee works just fine. Now mix the two ingredients using a wooden spoon and place your ‘cold’ coffee concoction in the refrigerator. Remember, you need to allow the pot to rest for about 12 to 24 hours. Yes, even though the extended periods sound surprising, anything less than 12 hours will lead to an awful, watered cold brew. After 12 hours, you need to filter your cold concentrate. You can use a large filter paper or cloth filter to keep the sludge out. Those of you who love sludge can go for a permanent mesh filter. Since the filtered solution is highly concentrated coffee, you most likely want to dilute it with water. Remember that cold brew coffee concentrate can be diluted with equal parts milk or water. If you feel that hot or cold water for making coffee doesn’t make a difference, you have to read this. Of course hot or cold temperatures outside might not stop you from obtaining your caffeine fix, but the difference in water temperatures is something you need to pay attention to. 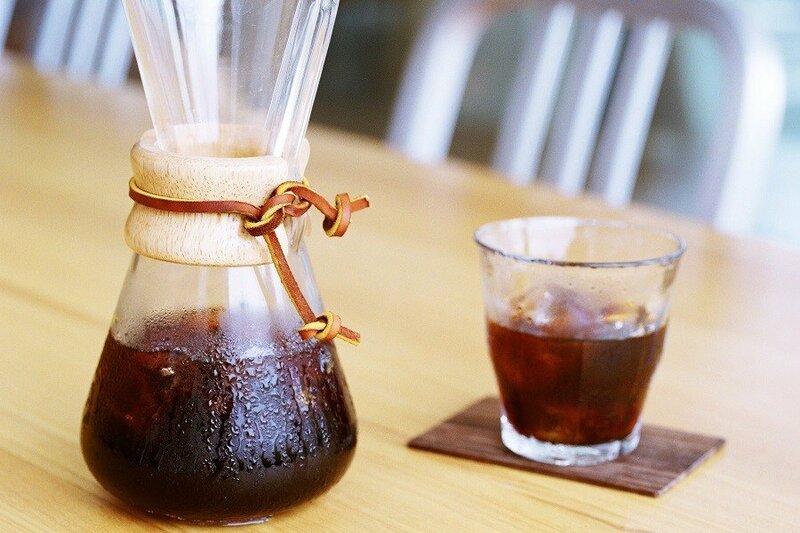 Coffee lovers can brew coffee by one of the two ways – cold brew or hot brew. Most of you would be familiar with the widely recognized and even iconic hot brew coffee equipments including the French press and the Vietnamese coffee filter to name a few. All you have to do is place coffee grounds in the equipment and then pour hot water over them. The general ratio for hot brew coffee is 8: 1, i.e. you need to add 8 oz. of hot water for every one ounce of ground coffee. This roughly comes down to 2 level tablespoons of coffee for 1 cup of water if you’re trying to make hot brew coffee at home. As you are aware, hot brew coffee is separated from the grounds and the liquid is consumed as soon as possible. Cold brew coffee demands more patience. This is the reason coffee grounds are mixed with cold water and then left untouched for hours in a Mason jar or Cold Brew Coffee Toddy system. Ground coffee and water is left to sit for 12 to 24 hours before the solids are filtered out. 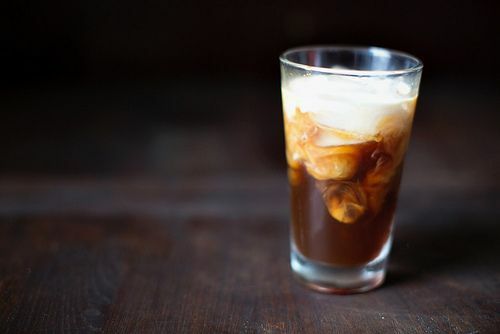 Some cold brew coffee recipes call for higher coffee: water ratio – 1 part coffee to 4 parts water, which is roughly 4 tbsp ground coffee per 1 cup of water. Once the solid coffee grounds are filtered, the cold concentrate is diluted with water or milk before being served. The difference in water temperatures between the two methods seems self-explanatory, but things are more interesting. Hot water produces fragrant coffee, which is acidic. However, cold water rewards coffee lovers for their patience. 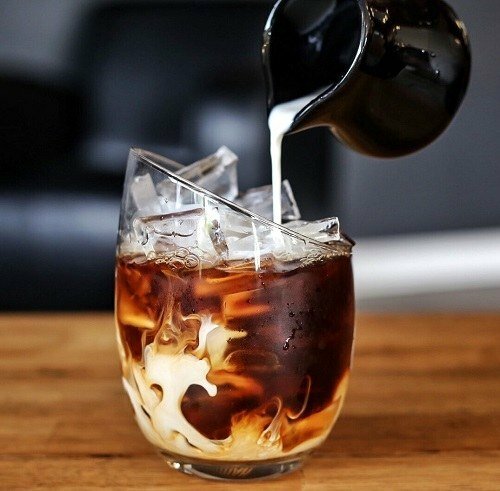 Cold brew coffee is smooth and sweet and it is important to note that the difference in flavor profile is somewhat dependent on the coffee grounds used. Coffee grounds contain a variety of volatile compounds and other components such as aromatic oils, acids and other organic molecules. These compounds collectively contribute to the distinct coffee flavor. Brewing on the other hand is the process of extracting the volatile, aromatic compounds from the coffee grounds. Technically the coffee mixture in your hand is a solution featuring aromatic compounds and water. The choice of coffee grounds along with other principal factors such as water temperature and brewing time decide how good your cup of coffee will taste. As you would be aware, the temperature of the water used in brewing affects the solubility of the aromatic compounds. Simply put, hot water dissolves the aromatic compounds out of the grounds and excessive temperature allows the heat sensitive aromatic compounds to evaporate into the air. It is seen that optimal temperature brings out the best in coffee grounds. Ideally, coffee dissolves best at a temperature of 195 to 205 degrees Fahrenheit. Hot brews are more said to be more flavorful because the aromatic compounds are more readily released from the coffee grounds. Remember, higher temperatures accelerates the release of aromatic components, but on the downside, hot water also causes oxidation and degradation of volatile coffee compounds causing your drink to taste bitter and sour. Perhaps the most notable degradation is the destruction of chlorogenic acid into quinic and caffeic acid which makes your drink taste acidic and bitter. If you talk about the flavor of cold brew coffee, coffee lovers suggest that the use of cold water gives a completely different flavor profile to the beverage – something that cannot be achieved with hot brew coffee. You need to remember that the majority of coffee compounds are still able to seep out of the coffee grounds even in cold water. Moreover, the compounds that do not dissolve in cold water are actually the ones that contribute to the bitter and sour flavors. This is one reason why cold brew coffee has a much sweeter and floral profile. It is also important to note that total brewing time doesn’t determine caffeine content in the drink. On the other hand, the bitter of your coffee is not an accurate indicator of its strength. Extending brewing time (more than what is needed) will only result in over extracted coffee, which doesn’t really taste good. Thanks to the higher coffee ratio, it is rare that anyone would drink cold brew coffee straight up. You can enjoy a sweet, smooth coffee drink by diluting the concentrate with equal parts milk or water. The internet and of course, coffee lovers have different views about whether or not cold brew coffee contains more caffeine. This is a valid question, but you also need to remember that caffeine is water-soluble and it will leak out of the ground coffee beans during the lengthy extraction method. The strength of your drink i.e. how much more or less caffeine your beverage contains depends on the amount of coffee grounds used. Since cold brew coffee uses more ground coffee than the traditional hot brew methods, it will contain more caffeine. High caffeine content is one reason why people use cold brew concentrate mixed with milk or water. It is sweeter and naturally less acidic. Cold brew method makes the extraction process much easier and more importantly, more selective. The ideal temperature of water extracts the flavorful compounds and the good thing is that the bitter compounds are left behind. ​Cold brew coffee is less acidic because cold water only extracts the flavorful compounds and does not degrade or alter the chemical structures of bitter aromatic compounds. Even though hot water makes the extraction process quicker, it changes the chemical composition of aromatic compounds, which makes your drink taste bitter. Good thing about cold brew coffee is that its chemical composition and structure does not change even if you store the concentrate in the fridge for a few days. You can drink your cold brew concentrate after dilution today and even after a few days, it would taste just fine if you store it in a container covered. After all, you surely don’t want your favorite beverage to absorb any smell or weird flavor from the fridge. Even though cold brew coffee uses a significantly more amounts of coffee grounds, you will be pleased to know that not even a tiny amount of coffee goes to waste. All you have to do is add a little bit of water, milk, or cream depending on your personal preference and make a very smooth cup of cold brew coffee as a lovely post meal option. Special steeping at low temperatures is one trick you need to get right with cold brew coffee. When you brew coffee with hot water, dark roasts work fine because you can extract caffeine and other volatile oils quickly and burned ‘ashes’ are not passed into your cup. If you talk about cold brew coffee, the long steeping time is enough for the ashes to dissolve and make your coffee taste awful. If you want to dramatically improve your cold brew experience, you have to roast the coffee beans lightly and allow your cold brew mix to steep a longer time. Your taste for coffee might be drastically different from the other person. Therefore, instead of buying a specific blend, you can try several products before going for one that suits your taste buds. Most coffee lovers prefer single origin beans for cold brew coffee and medium and light roasts have a lot more flavor than dark roasted beans. With cold brew, all of the fruity and floral notes of lightly roasted single origin beans are preserved and you will be amazed how good your coffee can taste. Even if you don’t have single origin beans, you can still get a decent cup of cold brewed drink if you use a lighter roast. Many people think that they will get stomach pain from drinking cold brew coffee – thanks to the higher coffee ratio. The fact is that you can enjoy a decent cup of cold brew coffee by using selective roast levels and specific low acid beans. 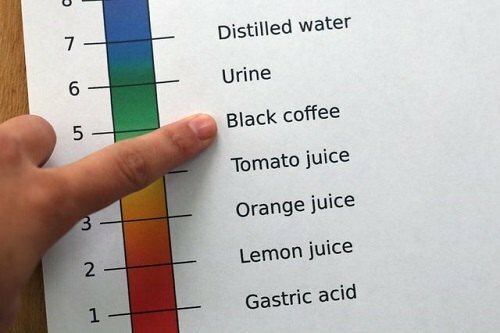 Yes, the reality is that coffee has an acidic pH but this is due to its chemical properties. 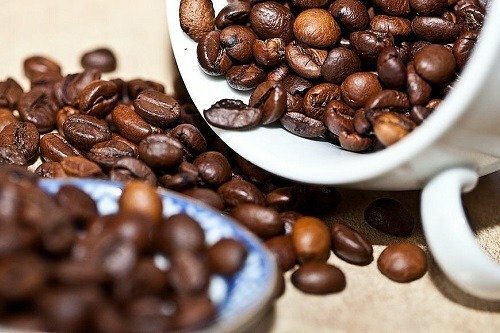 Recent studies found that the stomach irritating properties of coffee are due to specific substances namely catechol and N-alkanoly-5-hydroxytryptamides, which are generated when coffee beans are roasted lightly. Does this mean cold brew is not gentle on the stomach? Well, as stated earlier cold brew coffee is different from other beverages produced by hot brewing methods and has 50 to 70 percent less acidity. When coffee is steeped at low temperatures, you get a superior coffee concentrate, which interestingly has no impact on the sensitive stomach. That’s right. The bitter and acidic compounds associated with painful stomach are missing from cold brew coffee and you can peacefully enjoy your standard cup of coffee without worrying about stomach pain. How do you make irresistible cold brew coffee? Well, regardless of the coffee marker you choose, the recipe for cold brew coffee remains similar. Ideally you should use four to one water coffee ratio. This means for every cup of lightly roasted grounded coffee beans, you will add four cups of cold water. You can use a wooden or plastic spoon to stir or shake the mixture. Careful stirring will ensure that the grounds are fully saturated with water. Cover the mixture and let it rest for at least 12 hours. You can extend this time to 24 – 48 hours. Filter the mixture and store it in a covered container. Because cold brew coffee is concentrated, there will be a lot more caffeine than in a standard cup. You can add milk, water to your cup as its fine. Even a little bit of cream and sugar would do perfectly. If you want to enjoy a truly remarkable cup of cold brew coffee, you need to stick with a coarse grind. 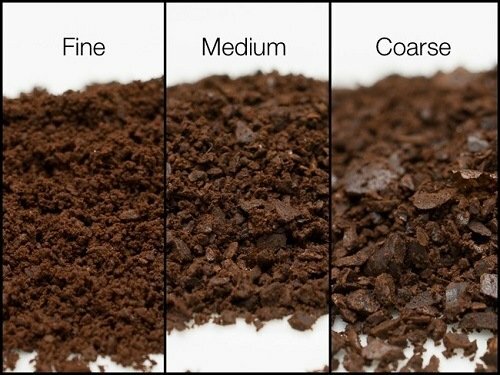 When you use a coarser grind for brewing, the filtration process would become easier and your coffee is less likely to taste bitter. As stated earlier, grinding the roasted beans too fine can heat up the grounds and the ashes have chances to enter your cup, which can negatively affect your experience. The coarse coffee grinds need to be fully immersed in cold water so that they are fully saturated and the aromatic compounds are released in the mixture fully. For best results, you should never mix the concentrated mixture directly with water. Instead, you can construct a homemade tea bag to infuse the coffee. Since you are not using hot water during brewing, you need to give grounded coffee enough time to immerse in water and release the aromatic compounds. So in this sense, premature or early filtration will result in lack of flavor and your cup of coffee will not taste as good as you want it to. Infuse complementary flavors like cardamom, nutmeg and even cinnamon to your diluted cold brew coffee. A combination of basil, mint, and lavender is a great choice if you want to enjoy a refreshing and relaxing cup of cold brew coffee. Add chilled coconut oil to add sweetness and ultra rich texture to your coffee. Try Brazil almond milk blend or sweetened condensed milk as a substitute for dairy milk. 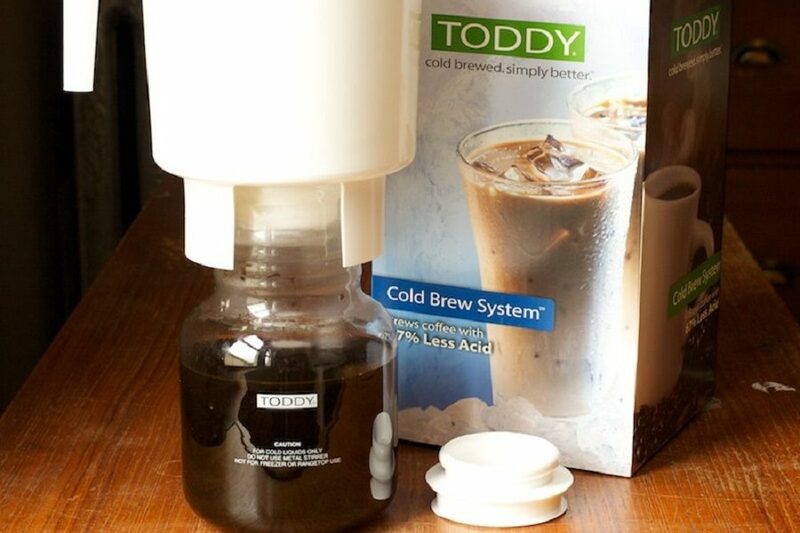 Toddy Cold Brew system helps you enjoy cold brew coffee without hassle. The best thing is that you don’t have to go through the entire brewing process every day. Just make your drink and store it in the refrigerator. The system includes a brewing container, a decanter made of glass, rubber stopper for the brewing container, filter paper and paper filter bags. You can add the coffee grinds and water to the container and let the mixture steep for 12 to 24 hours. 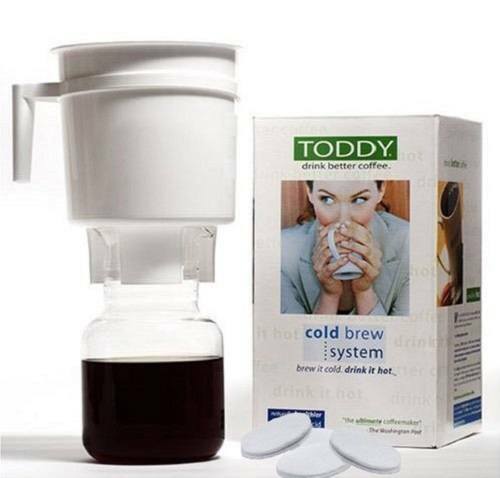 Toddy claims that their coffee maker produces cold brew beverage, which is 67% less acidic than regular coffee. This is particularly helpful in decreasing the number of stomach problems associated with drinking regular coffee. Filtron is one of the leading cold brew coffee makers in the market and has some great reviews. The concentrate you brew lasts for several weeks. Possibly the best thing about Filtron is that it is smaller compared to other devices available in the market and yet brews 50 ounces of pure, concentrated coffee. The coffee making system has two recipients. The water container sits on top of the brewing container and there is a rubber stopper along with a filter pad and a decanter. This is the cheapest press pot that can be transformed into a cold press brewer. If you’re not sure about how it will perform, just try a small batch and see how it works. Put the coffee grounds in the French Press and pour cold water, as you would normally do. Make sure you stir the mixture thoroughly and ensure that the grounds are immersed in cold water. For best results, let the brew infuse for 24 to 48 hours. You can use the affordable glass Sterling Pro French Press for a cold brew. The pricier models work great for hot brewing and practically are an overall for cold brew coffee. 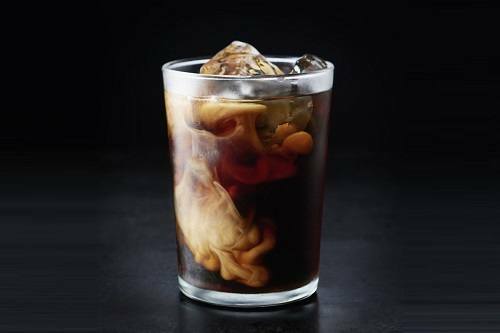 It’s not surprising that cold brew coffee has become a drink of choice for many coffee lovers. Here’s hoping that the tips and ideas mentioned here can help you make the best cup of your favorite beverage, anywhere, anytime.